Ihlström Eriksson, C., Kalling, T., Åkesson, M. & Fredberg, T. (2008). Business Models for m-services - exploring the e-newspaper case from a consumer view. Journal of Electronic Commerce in Organizations, Vol. 6, No. 2, pp 29-57. Åkesson, M. & Ihlström Eriksson, C. (2008). From Multi Channel Publishing towards Ubiquitous Media Environment. TAGA Journal, Vol. 10, pp. 126-148. 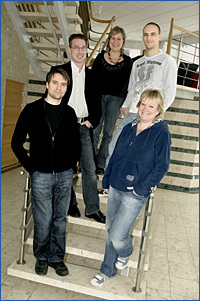 Ihlström Eriksson, C., Åkesson, M., Svensson, J., & Fredberg, T. (2007). Introducing the e-newspaper - identifying initial target groups. Journal of Media Business Studies, Vol. 4, No. 3, pp. 41-62. Åkesson, M.& Ihlström Eriksson, C. (2009). Advertising Challenges in Ubiquitous Media Environments. In: Pousttchi, K.; Wiedemann, D.G. (Eds. ): Handbook of Research on Mobile Marketing Management. Information Science Reference, Hershey (in press). Ihlström Eriksson, C. (2012). Visualizing Futuristic Ubiquitous Media Services - A Collaborative Approach in the Newspaper Industry. In Proceedings of NCM 2012 in Seoul, South Korea, April 24-26. Åkesson, M., & Ihlström Eriksson, C. (2008). Mobile Service Adoption - the Swedish Case Between 2006 and 2008. Presented at the Global Mobility Roundtable (GMRT 2008), Auckland, New Zealand. of the e-newspaper. In Proceedings of the 31st Information Systems Research Seminar in Scandinavia, Åre, Sweden, August 10-13. Ihlström Eriksson, C., & Åkesson, M. (2008). Ubiquitous Advertising Challenges. In Proceedings of 7th International Conference on Mobile Business, Barcelona, 7-8, 2008. Ihlström Eriksson, C., Åkesson, M., & Hakeröd, J. (2007). Advertising in Ubiquitous Media Environments. In Proceedings of IRIS'30, Tampere, Finland, August 11-14. Ihlström Eriksson, C. & Åkesson, M. (2007). An Interorganizational Learning Approach to New Innovations: Exploring the e-newspaper Case. In Proceedings of the 4th International Conference on Intellectual Capital, Knowledge Management and Organisational Learning, Cape Town, October 15-16. Åkesson, M. & Ihlström, C. (2007). The vision of ubiquitous media services: How close are we? In Proceedings of HCI International, Bejing July 22-27.